May a priority application and an even earlier application filed by the same applicant partially relate to the same invention, just as the priority application and a patent claiming priority therefrom may partially relate to the same invention (whereby the latter may benefit from partial priority under G 1/15)? If so, the priority application would be the first application in respect of only that part of the invention which is not the same as in the earlier application and priority would only be valid for that part, but not over the full scope of the claim. This was the key point in this decision. I. European patent No. 1 773 302, filed on 16 February 2005 and claiming the priority date of 23 July 2004 from US application 10/898061 (D1), was opposed on the ground that its subject-matter lacked novelty and inventive step (Article 100(a) EPC) and was insufficiently disclosed (Article 100(b) EPC). II. By decision posted on 2 December 2011, the opposition division decided that the patent in amended form met the requirements of the EPC. The decision was based on a set of claims filed as main request on 2 November 2011.
wherein the core is a compressed tablet; wherein the compressed tablet has an elongated shape; wherein the first and second gelatinous coatings are provided on said first and second ends of the core; wherein said first and second gelatinous coatings form a gap through which the subcoating is exposed, the gap being from 3% to 33% of the length of the elongated tablet as measured along its longest axis; and wherein at least one opening is provided through at least the subcoating to expose the exterior surface of the core". III. In essence, the opposition division held that the priority document D1 was the first application of the patent proprietor that disclosed the subject-matter of the main request. Indeed, contrary to the position expressed by the opponent, the patent proprietor's earlier application (document D22) described dosage forms wherein the first and second gelatinous coatings formed a gap of a different length compared to the gap width disclosed in D1 and in the main request (5% to 33% of the total length in D22 vs 3% to 33% in D1 and in the main request). This was demonstrated by the observation that the gap width of 3% to 33% of D1 represented added subject-matter compared to the gap 5% to 33% of D22. Thus, the main request benefited from the priority of D1. In view of this conclusion, the opposition division considered that the public prior use of the product "Extra Strength Tylenol Rapid Release Gels" alleged by the opponent was not part of the prior art pursuant to Article 54(2) EPC. The objection of lack of novelty based on this prior use was therefore dismissed. The subject-matter of the main request was also considered to comply with the requirement of inventive step. IV. The opponent (hereinafter: "the appellant") lodged an appeal against that decision. By letter dated 9 August 2012 the patent proprietor (hereinafter: "the respondent") requested that the appeal be dismissed (i.e. that the patent be maintained on the basis of the request found to be allowable by the opposition division) and filed 11 auxiliary requests. V. In a communication pursuant to Article 15(1) RPBA, issued on 12 October 2017, the Board expressed the view that part of claim 1 of the main request was not entitled to the priority date of D1 and observed that that part was the relevant one in relation to the alleged prior use. The Board furthermore informed the parties that it was inclined to remit the case for further prosecution to the opposition division, if the priority were found to be partially invalid. VI. Oral proceedings were held on 9 November 2017. The priority document D1 was a continuation-in-part of document D22. With respect of the part of D1 already disclosed in D22, i.e. the dosage forms wherein the gap was from 5% to 33%, D1 was not the first invention. Hence, the patent could not validly claim the priority date of D1. The fact that the range 5% to 33% disclosed in D22 was broadened to 3% to 33% in D1 did not give rise to a right to claim the priority date of D1 for that range. Otherwise an applicant could indefinitely postpone the starting point of the twelve-month period. The conclusion that claim 1 of the main request was not entitled to the priority date of D1 was in line with the principles established in the decisions of the Enlarged Board of Appeal G 2/98 and G 1/15. The product "Extra Strength Tylenol Rapid Release Gels" was offered for sale through a website on 12 February 2005 and was purchased by the appellant before 7 February 2015. Since the effective date for the subject-matter of the main request was the filing date of the patent, namely 16 February 2005, the public prior use was state of the art pursuant to Article 54(2) EPC and it destroyed the novelty of the subject-matter of claim 1. The case should not be remitted to the opposition division if the Board finds the priority invalid. The factual basis of the proceedings had not changed during the appeal proceedings. Both the grounds of opposition and the grounds of appeal contained full substantiation of the public use. These had not been challenged by the proprietor at any stage. As the alleged public use was that of the proprietor itself, the proprietor had been in an even better position than the opponent to present evidence as to its nature. Furthermore, the grounds of appeal addressed the question of inventive step on the basis of prior art that pre-dates both the application date and the claimed priority date. As these grounds were independent of the question of priority and public prior use and had already been considered and decided upon by the opposition division, there was no reason for them to be remitted. A remittal to the department of first instance was therefore inappropriate and a further extension of the proceedings was not in the public interest. Decision G 1/15 of the Enlarged Board of Appeal was mainly concerned with the specific issue of poisonous divisional applications and was not relevant in the context of the presence case. As affirmed in decision G 2/98 the concept of "the same invention" was based on what was disclosed in the priority application. The concept of disclosure was also the basis for amendments pursuant to Article 123(2) EPC. This was also clear from point 6.2 of G 1/15. Since amending a range of 5% to 33% to a range of 3% to 33% did not comply with Article 123(2) EPC, it had to be concluded that the two ranges defined two different inventions. Hence, the priority document D1 was the first application relating to the invention defined in the main request. The priority claim was therefore valid and the alleged public prior use was not state of the art pursuant to Article 54(2) EPC. The case should be remitted to the department of first instance in the event that the priority was not considered valid across the full scope of the claim because this would imply a substantial change of the factual basis of the proceedings. Indeed the circumstances in which the alleged prior use occurred, and its effect on the patentability of the requests had not been considered during the proceedings before the opposition division. It was therefore fair to the parties to remit the case to the opposition division. IX. The appellant requested that the decision under appeal be set aside and that the patent be revoked. X. The respondent requested that the appeal be dismissed, or that the patent be maintained on the basis of one of the eleven auxiliary requests filed on 9 August 2012. 1. The appellant challenges the novelty of claim 1 on the basis of the public prior use of the product "Extra Strength Tylenol Rapid Release Gels". In its statement setting out the grounds of appeal it explains that this product is a coated oral dosage form of acetaminophen characterised inter alia by the presence of two gelatinous coatings that form a gap through which a subcoating is exposed, this gap having a width which is approximately 17% of the length of the dosage form. Since the public prior use of this product allegedly occurred during the priority interval, it is necessary to assess the validity of the priority date claimed in order to establish whether the prior use forms part of the prior art pursuant to Article 54(2) EPC. 2.1 The dosage form of the main request comprises a first and a second gelatinous coating that do not abut or overlap with one another, thereby forming a gap through which a sub-coating is exposed. In claim 1 of the main request this gap is set as being 3% to 33% of the length of the dosage from. The same range 3% to 33% is disclosed in the priority document D1 (paragraph ). By contrast D22, an earlier application of the appellant relating to the same kind of gelatinous coated dosage forms, recites a range of 5% to 33% (paragraph ). 2.2 It is not disputed by the parties, that the priority application D1 discloses the subject-matter of claim 1 of the main request. The appellant contests, however, the validity of the priority claim on the basis of the argument that document D1 is not the first application, within the meaning of Article 87(1) EPC, disclosing the subject-matter of the main request. In its view, the first application is document D22, of which D1 is a continuation-in-part. The respondent argues that the dosage form of claim 1 of the main request and of D1 differs from the dosage form disclosed in D22 as regards the width of the gap formed by the two gelatinous coatings. It is not disputed by the respondent that document D22 discloses all the other features of the dosage form of the main request and of D1. 2.3 In assessing whether D1 is the first application within the meaning of Article 87(1) EPC the Board has to compare the invention in this document with the one in D22. As stated in decision G 2/98 of the Enlarged Board of Appeal (OJ EPO, 2001, 413), "in order to avoid any inconsistency, the criteria to be applied in assessing (i) whether an application is to be regarded as the first application for the purposes of determining priority and (ii) whether a claim in a later European patent application is in respect of the same invention as the priority application pursuant to Article 87(1) EPC must be the same" (G 2/98, Reasons 8.2). Thus, the assessment of whether an application is the first application follows the same criteria as the assessment of whether the application from which priority is claimed relates to the same invention as the later application. 2.4 In the present case, the range 3% to 33% of D1 is not the same as the range 5% to 33% of D22. However, in decision G 1/15 (OJ EPO, 2017, A82) the Enlarged Board of Appeal has acknowledged the concept of partial priority and has decided that "entitlement to partial priority may not be refused for a claim encompassing alternative subject-matter by virtue of one or more generic expressions or otherwise (generic "OR"-claim) provided that said alternative subject matter has been disclosed for the first time, directly, or at least implicitly, unambiguously and in an enabling manner in the priority document" (see Catchword). In point 6.4 the Enlarged Board of Appeal explained that, in assessing whether a subject-matter within a generic claim may enjoy partial priority, the first step is to determine the subject-matter disclosed in the priority document. The next step is to examine whether this subject-matter is encompassed by the claim of the application or patent claiming said priority. If the answer is yes, the claim is de facto conceptually divided into two parts, the first enjoying the priority corresponding to the invention disclosed in the priority document, the second being the remaining part not enjoying this priority. 2.5 In the Board's view, for reasons of consistency, the rationale of decision G 1/15 (concept of partial priority) must also apply in the context of deciding whether an application from which priority is claimed is the first application within the meaning of Article 87(1) EPC. Indeed, just as a priority application and a patent claiming priority therefrom may partially relate to the same invention, the priority application and an earlier application filed by the same applicant may also partially relate to the same invention. In that case, the priority application would be the first application in respect of only that part of the invention which is not the same as in the earlier application. 2.6 Clearly document D22 does not disclose the range of D1 in its entirety. Indeed, in the dosage forms of D22 the gap may have a width which is 5% to 33% of the total length of the dosage form whereas in the dosage forms of D1 the gap is 3% to 33% of the total length. However, in view of the considerations set out above, it needs to be assessed whether the invention disclosed in D22 is partly the same as the invention of D1. This assessment cannot be avoided because if the invention of D22 is partly the same as the invention of D1, the priority may be partly invalid and the prior use may become prior art pursuant to Article 54(2) EPC. (c) The invention of D1 is conceptually divided into two parts, one of them being the same invention as D22 (range 5% to 33%). Thus, in respect of the sub-range 5% to 33% D1 is not the first application within the meaning of Article 87(1) EPC. It follows that the part of claim 1 of the main request concerning the dosage forms wherein the gap width is between 5% to 33% of the length of the dosage form is not entitled to the priority date of D1. This part of claim 1 of the main request is the relevant one in relation to the alleged prior use since, according to the appellant, the gap between the two gelatinous coatings of the product "Extra Strength Tylenol Rapid Release Gels" is around 17% of the length of the tablet. 2.8 The respondent argues that decision G 1/15 was taken mainly with a view to avoiding the issue of poisonous divisional applications and should not be considered in the context of the present case. The principles established in G 2/98 should be applied instead. In this respect the Board observes that G 1/15 clarifies the criteria for assessing the entitlement to partial priority of a claim encompassing alternative subject-matter. There is no indication at all in the decision that these criteria are to be applied for the sole purpose of preventing an application from being anticipated by its own priority or by a divisional application. The Board furthermore considers that the criteria affirmed in G 1/15 do not deviate from the general principles established in G 2/98 for the assessment of the validity of the priority. G 2/98 states that the "priority of a previous application in respect of a claim in a European patent application in accordance with Article 88 EPC is to be acknowledged only if the skilled person can derive the subject matter of the claim directly and unambiguously, using common general knowledge, from the previous application as a whole" (see Headnote). As discussed above, according to G 1/15 "entitlement to partial priority may not be refused for a claim encompassing alternative subject-matter ... provided that said alternative subject matter has been disclosed for the first time, directly, or at least implicitly, unambiguously and in an enabling manner in the priority document" (see Catchword). Thus both decisions affirm the concept that (partial) priority is to be acknowledged for subject-matter that can be derived directly and unambiguously from the priority application. The assessment made by the Board in points 2.4 to 2.7 above follows this principle and is therefore in line with both G 1/15 and G 2/98. 2.9 The respondent furthermore refers to point 6.2 of G 1/15 in which the following passage taken from decision G 1/03 is quoted "... the extent of the right to priority is determined by, and at the same time limited to, what is disclosed in the priority application. In order to avoid any inconsistencies, the disclosure as the basis for the right to priority under Article 87(1) EPC and as the basis for amendments in an application under Article 123(2) EPC has to be interpreted in the same way." In its opinion this passage would indicate that the assessment of priority should be made by applying a test under Article 123(2) EPC, as the opposition division did. 2.9.1 The Board agrees that the assessment of priority and of the requirement of Article 123(2) EPC are both based on the concept of disclosure. This means that when deciding what is disclosed, in the original application or in the priority document, the same criteria are to be used. However, it is the Board's view that examining the validity of the priority by performing a test under Article 123(2) EPC (e.g. by assessing whether a claim C claiming priority from an application P would be allowable under Article 123(2) EPC if P were the application as filed and C an amended claim), may in some circumstances lead to wrong conclusions because the concept of "partial" validity of an amendment does not exist, whereas the concept of partial priority does. This consideration also applies when a priority application is compared with an earlier application filed by the same applicant in order to verify whether the priority application is the first application. In this case too, the mere application of an assessment pursuant to Article 123(2) EPC as has been made by the opposition division in the present case, may lead to wrong conclusions, as explained below. 2.9.2 The opposition division concluded that amending a range of 5% to 33% to a range of 3% to 33% would not be allowable under Article 123(2) EPC. It deduced therefrom that the invention of D1 was not the same as the invention of D22 and therefore that D1 was the first application for the invention claimed in claim 1 of the main request and the priority was valid over the whole scope of the claim. The Board agrees that amending a range of 5% to 33% to a range of 3% to 33% results in addition of subject-matter. However, both ranges encompass an identical part, i.e. the sub-range 5% to 33%. This sub-range defines alternative dosage forms in which the gap has a width of between 5% and 33% of the total length of the dosage forms. Such alternative dosage forms do not change their identity whether they are claimed as such or whether they are claimed as a part of a broader group of compositions, which include other compositions wherein the gap width is outside the range 5% to 33%. In other words, a dosage form in which the gap has a width which is e.g. 20% of the total length of the dosage form, is the same no matter whether it is part of a claim covering compositions wherein the gap is between 3% and 33% or whether it is part of a claim covering compositions wherein the gap is between 5% and 33%. It is therefore clear that the inventions of D1 and D22 are partly the same, i.e. they relate in part to the same dosage forms. Thus, in the present case, the mere application of an assessment pursuant to Article 123(2) EPC to the assessment of the validity of the priority claim does not allow to conclude that D1 and D22 relate in part to the same invention and therefore that the priority is not valid over the whole scope of claim 1. 2.10 During the oral proceedings the appellant expressed the view that the fact of broadening the invention disclosed in D22 by the filing of D1 did not give rise to a right of priority for the subject-matter already disclosed in D22 because this would result in an extension of the priority right by merely shifting the end point of a range. The Board agrees with the appellant on this. The broadening of the invention of D22 consists in the addition, as part of the scope of claim 1 of D1, of alternative dosage forms, i.e. those forms wherein the gap is equal or greater than 3% and less than 5%. As discussed above, the fact of adding alternative compositions, does not modify the identity of the compositions that were already in D22, i.e. those wherein the gap is 5% to 33% of the total length of the dosage. In other words, the compositions of D1 wherein the gap is between 5% to 33% are the same as compositions of D22. It would be unjustified to grant a priority claim on the basis of D1 in respect of these formulations too. Otherwise, an applicant could postpone the priority date of an invention disclosed in a first application, merely by filing a new application in which some alternative subject-matter has been added and this could be repeated several times. Under this assumption, even a cosmetic modification of the first invention could give rise to a new priority date, which would not be justified. 3.1 The primary function of an appeal is to consider whether the decision issued by the first-instance department is correct. Hence, a case is normally remitted if essential questions regarding the patentability of the claimed subject-matter have not yet been examined and decided by the department of first instance. 3.2 These observations fully apply to the present case. The opposition division decided that the main request was entitled to the priority date of D1 and as a consequence it did not assess whether the public prior use alleged by the appellant actually occurred and, if so, what its effects on the patentability of the requests were. In the Board's view, these circumstances justify a remittal to the opposition division. 3.2.1 The appellant remarked that all the facts and arguments supporting the public prior use had already been presented by him during the first instance proceedings. In its opinion, the Board's decision on the priority had therefore no effect on the factual basis of the proceedings. In the Board's view, however, these considerations do not alter the fact the the opposition division did not make any assessment in relation to the prior use. Thus, if the appellant's request were allowed, the Board would be the first instance to assess the facts and arguments submitted by him in relation to the prior use. This, however, goes against the principle that the main function of an appeal, due to its judicial and therefore less investigative nature, is to assess the correctness of the decision issued by the first-instance department. This principle is to be followed, in particular, when the questions that have not been examined during the first instance proceedings relate to complex matters, such as the assessment of a prior use. 3.2.2 The Board also regards as inappropriate to assess inventive step exclusively on the basis of the prior art documents published before the priority date, as suggested by the appellant. This "partial" assessment of inventive step would not avoid in any case the necessity of remitting the case to the opposition division for considering also the effects of the prior use, if one request were considered inventive over these documents. Hence, since the possibility of a further prosecution of the case before the opposition division remains open, the Board considers it appropriate to refrain from taking a decision on inventive step based on a partial assessment of the prior art since this may have an impact on the further prosecution of the case. 3.3 Under these circumstances, and in keeping with the respondent's request, the Board decides to remit the case to the opposition division for further prosecution (Article 111(1) EPC). For reasons of consistency, the rationale of decision G 1/15 (concept of partial priority) must also apply in the context of deciding whether an application from which priority is claimed is the first application within the meaning of Article 87(1) EPC. Indeed, just as a priority application and a patent claiming priority therefrom may partially relate to the same invention, the priority application and an earlier application filed by the same applicant may also partially relate to the same invention. In that case, the priority application would be the first application in respect of only that part of the invention which is not the same as in the earlier application (see points 2.1 to 2.7). This decision T 282/12 (pdf) has European Case Law Identifier: ECLI:EP:BA:2017:T028212.20171109. The file wrapper can be found here. 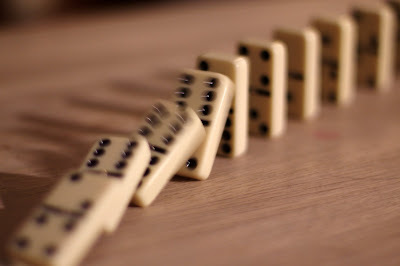 Photo "the domino effect" by Kurt:S obtained via Flickr under CC BY 2.0 license (no changes made). Independently of the possible application of G 1/15 in the present instance, I would think that the opposition division erred when it found that when applying Art 123(2) it concluded that the priority based on D1 was valid. It simply compared apples with pears. In T 842/05, an intermediate generalisation was carried out between the priority document and the later document. The Board held that the intermediate generalisation should not be queried as added subject-matter, but that the consequence was that the priority was not valid, as it was not the same invention as that disclosed in the priority document. D 1, 3 – 35%, is not the same as the one in the earlier priority document D 22, i.e. 5 – 35 %. By acknowledging that there was added subject-matter between D 22 and D1 the OD should have realised that it was not the same invention. It is however correct to say that D1 is the first application disclosing 3-35%, but this is only half the story. One can be thankful to the opposition division for making this mistake, as it allows the board to clarify the situation and apply to G 1/15 to it. This decision shows that one has to be very careful with continuations in part in the US style. I think you are overlooking that priority document D1 disclosed exactly the range that was claimed: 3-35%. The earlier application D2 (from which no priority was claimed) disclosed a different range. See point 2.1 of the decision. So the OD did not compare apples and oranges (or even pears). What I find interesting that in this decision the EPO questions and reverses their own view on ranges, i.e. that a range does not automatically disclose every point in the range but that it only disclosed the end points. While the view taken in this decision makes sense, it would make just as much sense when considering novelty of "selection inventions". In order to say that the priority of D1 was valid, the OD stated in the decision that D1 was the first application which disclosed the range 3-33%, as it represents added subject-matter with respect of the range disclosed in D22 5-33%. See §5 of the decision of the opposition division. The earlier priority was indeed not claimed, but by coming to the conclusion that the priority based on D1 was valid, the opposition division mixed up the issues of priority and added subject-matter from one application to the other. This is comment found in some examiner's report on paper C of the EQE when priority is at stake. Hence the quotation of T 842/05. What is also important is that D1 is a continuation application of D22. It is not the first attempt I see from a US applicant to claim priority from a continuation rather than from the original application. Often it may work with the first continuation, but it has to be checked. It does not work with further continuations as they are often filed more than 12 months later.